Giving access to the Master degree or directly to the job market. In 3 years, our Bachelor programmes offer you a generalist training in marketing, communication, management, law, finance and global business. Internationally oriented, our Bachelor can be followed 100% in French or 100% in English. It also offers a great opening to the job market, with a maximum of 13 months working placement periods. Year 1: Discover the fundamentals in core subjects: marketing-communication, management-law-finance, trade management. Courses examples: Consumer behavior, Marketing tools, Distribution systems, Accounting, Company law, Microeconomics and macroeconomics, Social analysis, IT tools, Quantitative techniques, Language, Communication, Business creativity, Entrepreneurial creativity. Courses examples: Marketing study and strategy, Distribution and communication policies, Taxation control, International affairs, Company IS, Business development, Entrepreneurial leadership. Courses examples: E-business, International Marketing, International purchasing, Economic and Financial news, International accounting, Advanced negotiation, trading management, commercial strategy, business models, ethics and social responsibility, consulting project, business game. 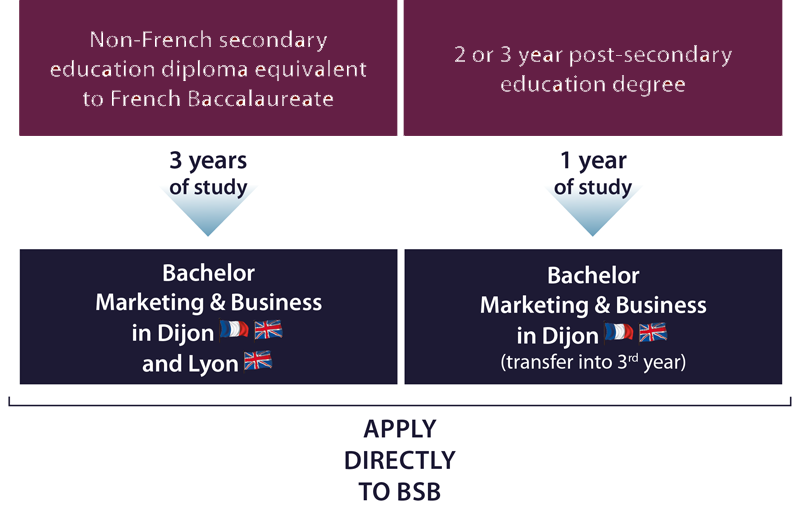 5 possible specializations to choose during the last year: Wine Tourism (in English), International Business Management (in English), Business Development (in French or in English), Digital Management (ein French or in English), Luxury Marketing in French or in English). Examples of positions open to you after our Bachelor Marketing & Business program Commercial Manager, Sales Manager, Buyer, International Buyer, Area Sales Manager, Export Assistant, Communication Project Manager, Regional Manager, Export Manager for a specific area, Consultant/ Advisor, Logistics Manager, etc. With its dual AACSB and Equis accreditations, BSB belongs to the Top 1% best business schools in the world. BSB’s Master in Management degree is EPAS accredited and is ranked 77th by the Financial Times (September 2018). BSB created in 1899 and has longstanding ties to the business community. BSB has an impressive network of 16,000 alumni around the world.